While there was a show of strength of police force and boasting of development activities on the eve of 67th Republic Day in the district headquarters, the red rebels unleashed a reign of terror in the tribal hinterland like Parsali and Hatamuniguda. Maoists have been active in Rayagada after series of murders in the neighboring Koraput District. Celebration started with chanting of Ram Dhoon during early but chilled hours of the day. This event was organized by the District Information and Public Relation Office. At 7 AM flag hoisting was done in different govt and non-govt organizations. Several schools paraded through the main road. Chairperson and councilors of the municipality alongwith citizens of the town garlanded the statues of the eminent personalities who contributed for the country in the past in their respective wards. 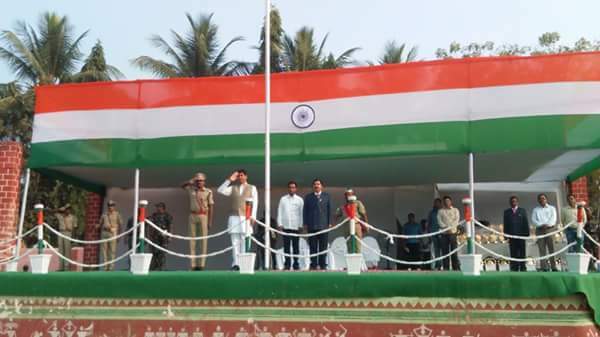 Sri Arun Kumar Sahoo, Minister Law and Panchayati Raj, who was the Chief Guest on the occasion, hoisted the flag at the local GCD High School ground. He, as usual, praised the contributions of freedom fighters of erstwhile Koraput and boasted recent govt schemes initiated by the BJD Government. The gathering, which was very thin, enjoyed the sports and cultural activities exhibited by the tiny tots. Sri Sabyasachi distributed prizes to the winners of several events which were earlier organized in the context of republic day. He then went the Seba Samaj orphanage and the district hospital to distribute fruits and sweets to the inhabitants. “Slowly the Republic Day is losing its charm. The fruit of democracy is yet to be enjoyed by the common men of the area, especially tribals. Scores of Acts like MGNREGA, Forest Rights Act, National Food Security Act, Rights to Information Act, Prevention of Atrocities Act, etc have been promulgated for the poor to be violated very often by none other than their monitors. The saga of dispossession of the tribals is still on in the name of development”, said Smt Bidulata Huika, state convenor of Odisha Adibasi Manch.